The fourth animated feature by the Walt Disney Company which was released in 1941 and soon considered indisputable classics: it won Best Animation Design at the Cannes Film Festival and the Academy Award for Original Music Score. It was mentioned by Manson in the song Ka-boom Ka-boom from The Golden Age of Grotesque. 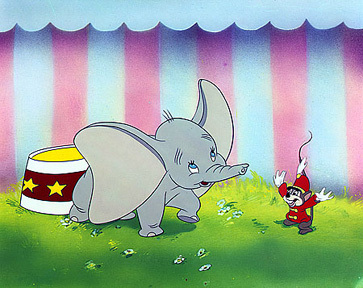 Dumbo tells a story of the circus elephant calf Jumbo Jr. born with excessively big ears. This infirmity was considered by his congeners as shameful, so the elephant was immediately ridiculed and cruelly nicknamed Dumbo. His mother's tries to defend her offspring appeared to be unsuccessful: Dumbo is pulled away from her while she is imprisoned. A little mouse Timothy becomes the only friend of the outcast elephant and it's he who suddenly discovers that Dumbo is capable of flying. Once Dumbo and Timothy drink water without knowing that it was accidentally spiked with moonshine. They become inebriated and hallucinatory, seeing pink elephants sing and dance before their eyes. When they awake they discover themselves on a tree over 100 feet up to the amusement of local crows. Timothy suggests that drunken Dumbo flew both of them to the top of the tree using his ears as wings. The crows find this idea hilarious but Timothy persuades them into helping Dumbo to develop his unique feature. Dumbo the Flying Elephant becomes the star of the circus and an international celebrity thus disgracing his mockers. Dumbo is mentioned in The Golden Age of Grotesque alongside with Mickey Mouse series and Snow White and the Seven Dwarfs and it's homage to the entertainment industry of the 1920s and 1930s since Disney's films were among its most outstanding pieces. However Dumbo is not merely mentioned in the record: using the film's plot Manson builds a very complex and multilayer metaphor that is very important for understanding The Golden Age of Grotesque concept in the part where the traditional opposition of 'high art' vs. 'low art' is deconstructed. The status of the entertainment industry is one of the major problems in the album and traditional view of it as something 'low' is attacked from different angles simultaneously. Particularly Manson draws parallels between the elitist concept of art and the Nazi doctrine of "degenerate" art finding that they are obviously alike. In Ka-boom Ka-boom Dumbo is mentioned as a part of the neologism "Dumbo jet" that was derived from the idiom 'jumbo jet' - a very large airliner, a common name for the Boeing 747. If we turn to etymology of this idiom we'll find out that Boeing 747 was named as such after an African elephant Jumbo that lived in the London Zoo in the second part of the 19th century and then performed in a circus. Later its name became a popular nickname of circus elephants and also became synonymous with something large or huge. Dumbo is a circus elephant that is capable of flying, and moreover his real name is Jumbo Jr.
As it was stated above, in The Golden Age of Grotesque era the artist uses one more - and the most famous - Disney's character, Mickey Mouse, which is quite naturally considered by Manson as some symbol for the entertainment industry as a whole. It is essential that Mickey Mouse was viewed by the Nazis as a "degenerate" character. "All the art we have done, has many levels, but in regards to Mickey...his image was also considered to be 'degenerate' by the fascist government in [1930's Germany]. In America he represented so much more," said Manson in February 2003. It is easy to notice that Manson accentuates Mickey Mouse's ears as a distinctive and easily recognizable feature of this character. The central visual image of The Golden Age of Grotesque era is a weird combination of Mickey Mouse's ears and blackface make-up. "I'm the leader of the club / And I've shrugged off / My mouse ears", sings Manson in Ka-boom Ka-boom. And while commenting on his Anaclitism watercolor which is a self-portrait as Mickey Mouse and Van Gogh together Manson said, "So I've cut off one of my mouse ears and I'm staring at it and wondering how I will still be the leader of the club" (The Mickey Mouse Club was a popular American television series in the 1950s). Quite appropriately the only friend of Dumbo is a little mouse named Timothy. As is well known, the co-author of The Golden Age of Grotesque was Tim Skold. It was he who helped Manson to express his ideas in the proper way after the previous main guitarist, Twiggy Ramirez, left the band due to artistic differences with Manson. 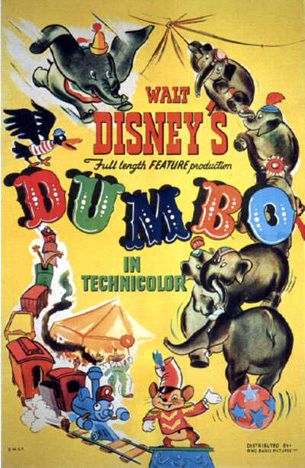 No less important that the crow characters in Dumbo are in fact African-American caricatures - the film was quite often criticized for that "racist" image. But actually the crows are among the most sympathetic characters of the film and the authors were not so much trying to ridicule black people as they consciously referred viewers to blackface performances: the leader crow is named Jim Crow in the film. The mock character with such a name was created by American comedian Thomas Rice and it made blackface a widespread phenomenon. Just as crows helped Dumbo to develop his unique feature blackface performances were among the most inspiring sources for Manson while conceiving The Golden Age of Grotesque. Finally it should be mentioned that Dumbo reveals his ability to fly being inebriated. The significant part of The Golden Age of Grotesque was written by Manson under the effect of absinthe - may be the most potent alcoholic beverage. "It was strange circumstances. There was a lot of weird, decadent things going on. A lot of absinthe", said Manson about the album's recording process speaking to Las Vegas Review Journal in July 2003. "We're a death-marching band / Peter Pan off the wagon", sings the artist in Ka-boom Ka-boom. The release year of the film, 1941, when World War II was in full swing is also important. Bearing in mind the aforesaid it's time to turn to the line in which neologism "Dumbo jets" is used: "We fly No-Class Dumbo jets". 'We' is certainly referring to the band as well as its fans. 'No class' usually means "low-quality, low-grade" but the artist applies it to airliners meaning that there're no traditional first, business and economy classes - another blow at the opposition 'high' vs. 'low'. As we see a simple at first glance neologism 'Dumbo jets' hides a very complex, multilayer metaphor that is very significant for understanding The Golden Age of Grotesque concept.